The Performing Arts Department encourages students to explore the world of artistic performance as a means of communication and expression. The program is designed to address the individual potential of the emerging artist within a collaborative ensemble united in vision. 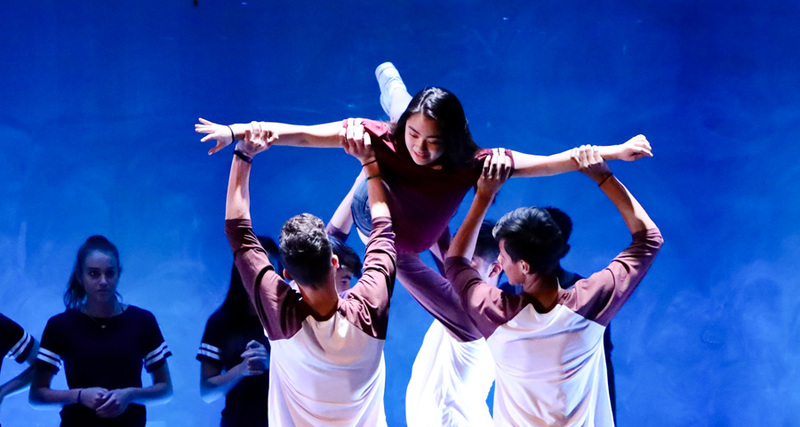 Students cultivate their passion for the creative and intellectual pursuit of artistry in areas including dance, drama, vocal and instrumental music and stage technology. The faculty takes pride in mentoring individuals and conducting process-oriented curricula, with goals of instilling performance discipline and nurturing student exploration and discovery. As technique and skills develop, we challenge and celebrate each ensemble through many performance opportunities, including instrumental and choral concerts, dance productions, and theatrical performances in the middle and high school, both on campus and in the greater community. Through master classes and field trips, the program engages Los Angeles’ plentiful offerings to supplement an enriching and expansive experience. This is an introductory-level dance class for 7th grade students emphasizing the development of skills in various styles and techniques such as ballet, hip-hop and social dances. Students not only learn and discuss dance history but also explore the influence of dance in our everyday culture and mainstream media. In addition, students explore spatial awareness, partnering and performance skills through various movement-based games and activities. The final project in this class is a group dance choreographed entirely by the students based on well-known stories and fairytales. This class emphasizes the continued development of skill and technique in various dance styles such as jazz, ballet, hip-hop and modern/contemporary. Students also learn and discuss dance history and development and the influence of dance in our modern-day culture. In addition, students explore improvisation and choreography individually and in groups. Eighth-grade dance students are required to perform in either the Winter Dance Concert or the Spring Dance Concert. The Dance and Advanced Dance courses focus on dance technique in a variety of styles, including ballet, modern, jazz, hip-hop and tap. The courses involve creative movement and the exploration of weight, space, effort and time, as well as dance history, choreography and improvisation. Students learn from guest teachers and take professional-level classes in the Los Angeles area. Each student has the opportunity to incorporate his or her own style, rhythms and music. Students in all classes are required to choreograph and perform dances in the Winter and Spring Dance Concerts. Dance Company follows the same principles as the Dance and Advanced Dance programs at a higher intensity and investment. The Dance Company focuses on a higher level of technical training, as well as a specific concentration on choreography. Students also take professional-level classes outside of the classroom setting. Students who audition and are accepted into the Dance Company class will be asked to perform at school events such as the Family Barbecue and Admissions Open House, as well as at local dance concerts and festivals. Seventh Grade Drama introduces students to life onstage and all the imaginative possibilities that lie within. The class addresses introductory concepts such as personal presentation, projection, movement and more, all with the goal of boosting confidence in front of an audience. Students discover their own avenues for expressing themselves and learn the tools used to effectively communicate a story. Through theater games, a variety of scripts and assorted exercises, students develop characters and learn to deliver performance in a fun and supportive environment. Eighth Grade Drama is a further exploration of concepts presented in the 7th grade, with an additional emphasis on production. In the first quarter, students focus on acting technique needed for performance and apply it to improvised and scripted exercises. Additionally, students have an opportunity to learn the production components (such as lighting, sound, directing and more) involved in creating a show. Together the class produces a short play for public presentation and celebration of their achievements. Drama explores the world of theatre through many facets including acting technique, scene study, drama history, production elements and more. What is theater? How does the art form represent life? What role does it play in present society? The class dives into historical worlds and draws connections to our contemporary perspectives. Through improvisation, observation, character development and performance technique, the actor brings to life stories that are diverse and engaging. The course also examines the technical side of theatrical production, including space, lights, sound, makeup and more. The Advanced Drama course focuses on the individual actor’s artistry by exploring different acting techniques including Method Acting, Meisner Technique and more. As a class, we strive to capture the present moment as an impetus for all stage life within a given reality and also to examine emotional response as a basis for action. Through studying the artist’s process, students build a foundation for performance and develop an individual technique via diverse styles of scene study performance, acting fundamentals exercises, storytelling and improvisation. Over the course of the year, the student discovers his or her own approach towards developing and portraying characters onstage within a collaborative atmosphere. Drama 3 is designed to empower students to create their own performance pieces. As a class, we step back to examine theater as a form for artistic expression: image, composition, arc, balance and the intersections of philosophies. What is considered theater? What is art? What is entertainment? From studying compositional theory and style, the class learns tools needed for adaptation to initiate the process of originating work. Students analyze the many ways to tell a story using spoken word, music and movement within different forms, including devised work, site-specific work and performance art. As the year progresses students explore the question of what story they want to tell. The course culminates in an original show of the students’ own devising. Drama 4 is an amalgamation and application of theater training accrued over the years at Prep. The class breaks ground as a new production company, complete with a mission statement and personnel roles to fulfill. The class’s primary objective is to cast, direct and produce different works for public performance at the end of each semester. Students analyze a script’s presented world and propose aesthetic and artistic choices with consideration of the practical and logistical implications involved with production. It is a student-driven project that pushes individual acting technique, dramaturgical inquiry and perseverance towards actualizing a major goal. Each student is an active ensemble member, artist and visionary. In 7th Grade Vocal Music, students discover the unique joy and satisfaction that comes from creating music with other people. The class gives an introduction to the fundamentals of music theory, including basic notation of music and rhythm. We develop an appreciation for music and connect it to everyday life by gaining familiarity with diverse musical styles, cultures and historical periods, including American popular music, Western classical music and world music. Students learn basic vocal skills through ensemble singing with an emphasis on correct posture, breathing and proper vocal technique in order to gain self confidence and ease. Eighth Grade Chorus students participate in a fun and supportive environment to further pursue an interest in singing and making music with others. The singers continue to develop knowledge of the elements of music and proper vocal technique, with emphasis placed on two-part and three-part singing of a variety of musical styles and genres. Students focus on understanding the changing voice and the development of a good choral sound, as well as critical listening, ear-training and sight-reading skills. The class frequently combines with the Eighth Grade Instrumental Music class to collaborate on special class projects, performances and recordings. Vocal Music (VPA 9) explores the wonders of choral/vocal music through a dedicated choir composed of talented singers from grade levels 9-12 aspiring towards various performances offered throughout the year. Students learn how to musically express themselves by focusing on skills such as breathing, posture, articulation, diction and applying them to pieces rehearsed in class. Members of the choir may experience a repertoire ranging from early Renaissance to present day, celebrating the art of music both as an ensemble and as soloists. The cumulative work is presented at the Winter and Spring Music Concerts as well as at performances within the local community. The Flintridge Singers welcomes all interested high school students of varied vocal talents and abilities who love to sing and are interested in vocal performance. Students actively sing each day and develop vocal techniques including proper breathing, tone production, intonation, articulation, enunciation and sight-singing skills through ensemble and solo performance. The choir sings a diverse variety of choral music, including standard classics, popular American music and music originating from other cultures that is appropriate in difficulty and range for beginning to intermediate and advanced students. Chorus is a performance-based class, and participation in the Winter and Springs Music Concerts, school assemblies and Prep's Baccalaureate, as well as other performance opportunities that arise throughout the year, is required. Instrumental Music for the 8th grade gives students the opportunity to perform as part of either the 8th grade jazz-rock ensemble or, for students who play orchestral instruments, the 8th grade chamber ensemble. Students work on musicianship, music theory fundamentals and the art of ensemble playing in this rehearsal setting. Instrumental and vocal music classes combine to collaborate on specific music projects, including recording and concert performances. Instrumental Music in the 9th grade (VPA) is an introduction to crafted ensemble work that may include fundamentals of musicianship, group listening and ear training, solo improvisation, technique development and much more. As students drill their own personal skills, they are also to consider their individual sound as a contribution to a piece; tone, pitch, blend, line and movement are among the many factors that impact performance quality. Students have an opportunity to perform a variety of styles at several concerts throughout the year and participate in studio recordings. Students participate in a performing jazz ensemble setting. Through rehearsal, students learn to perform jazz music, with an emphasis on their particular instrumental role in the ensemble, interpretation of jazz style, and improvisation through accompaniment, soloing and interplay. The ensemble performs at least four on-campus concerts per year, with other on- and off-campus events throughout the year. The orchestra class forms the core of the full symphony orchestra. Students learn and perform repertoire primarily, though not exclusively, from the Western concert repertoire from the Renaissance to present. Students rehearse music of the symphony orchestra as well as work in chamber music settings. Students perform at least four concerts per year. This course, equivalent to a first-year college course, develops students’ skills in identifying, understanding and describing elements and events in aural and written music. It focuses on the major-minor tonal system of Western music and includes twentieth-century scales, harmony, composition, jazz and contemporary music. Students who are successful in this course will be qualified to take the Advanced Placement exam.